This series is the sole title that bridges Secret Wars 2015 with the All New All Different Marvel. As in, it makes reference to Secret Wars 2015 that no other title is bothering with. This issue promises to have The Collector and The Grandmaster versus Maestro and Punisher 2099 – Jake Gallows. I’m not quite sure what happened in the other five issues as this issue reads like an origin story – which probably would have been good prior to the sixth issue but dems the breaks, I guess. Will this issue finally reveal that the soulsword on Maestro’s back is Illyana’s? Let’s find out! The Battlerealm. After the Secret Wars. Before the Contest. Maestro wakes up, he was left behind after Battleworld crumbled. He was confronted by The Elders of the Universe. They are – The Collector, The Runner, The Gardener, Father Time, The Explorer, The Trade, The Obliterator, the Astronomer and The Judicator. There are also – The Professor, The Champion and The Grandmaster. The only ones I recognize are The Collector, The Champion and The Collector. I suspect the other ones are madeup. The Judicator looks like Kid Gladiator. The mutliverse did indeed die and was reborn. Now this new omniverse is full of potential. No one is sure how to divide the power. Typically, The Grandmaster proposes a Contest of Champions. I like how the Professor predicted that and is unimpressed with the suggestion. Each will pick a champion and whoever wins, gets all of the power. Maestro promises to kill them all, so Collector picks him for his champion. Mark is her Darkchylde persona but since she isn’t all red, I doubt she’s from the Inferno Secret Wars 2015 series. Though that would have made sense, if she was pulled from before she died. The contests were not “to the death” but that’s just how Maestro fights. These fights only take place in these flashbacks, the fights prior to this issue are all overseen by Maestro. Punisher 2099 also fought to the death. On top of that, these two made it to the finals. The two start forming a plan. 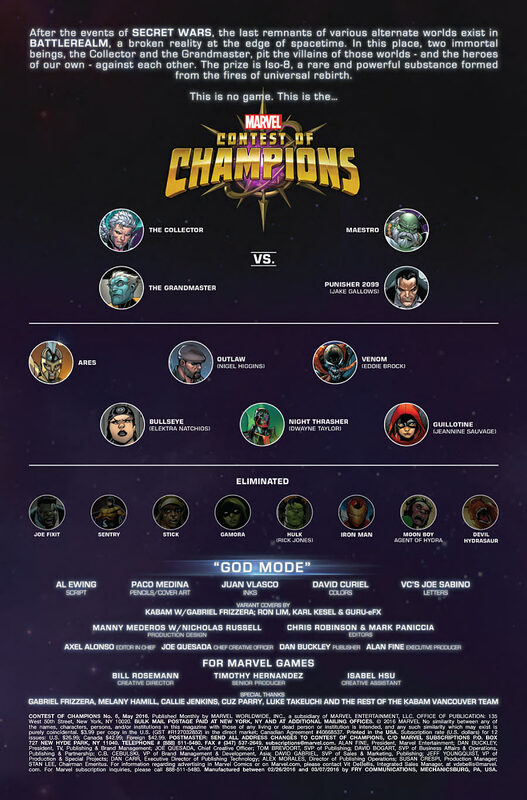 Grandmaster’s champion is Punisher 2099. The two final champions finally face off but Maestro refuses to fight. So now these two are going to pick their own champions and this apparently goes on and on until we get to the beginning of this series. Maestro teleports to Grandmaster’s headquarters and four-and-a-half minutes later, has beaten the elder utterly. Now he has the bulk of the power, which they call ISO-sphere. Which is what they call the energy in Avengers Alliance, so is this a game related comic? I feel like I’ve seen Contest of Champions in the Google Play store. I had no interest in it until I saw that Magik is a playable character. Since I stopped playing Avegners Alliance, I’ve been sort of looking for a new game to play. Does anyone know the fastest route to recruiting her? The game is 375MB and my phone is lousy with data, I really need to buy a SD card or something. Maybe one of these days. Anyway, Maestro teleports to The Collector and defeats him. 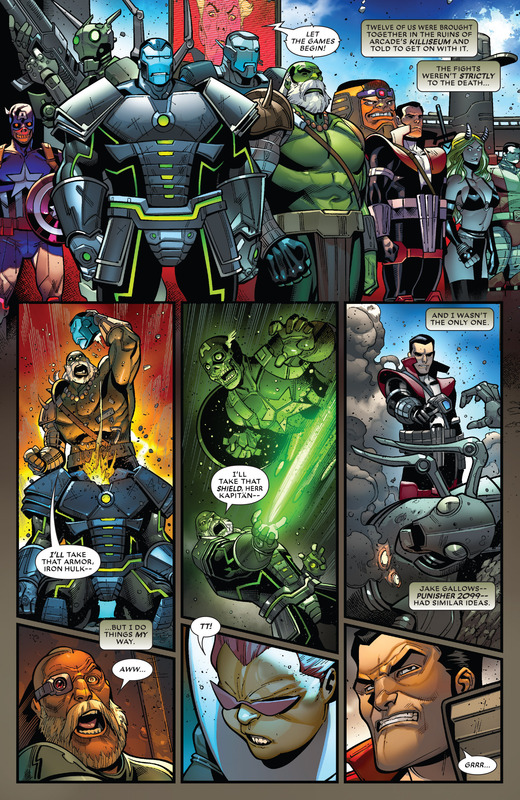 Now with the ISO-sphere complete, he becomes the God-King that Doctor Doom was during Secret Wars 2015. Punisher 2099 starts getting the heroes in line, I guess he’s cool with being Deputy God-King. Earth. The Triskelion. New York City. 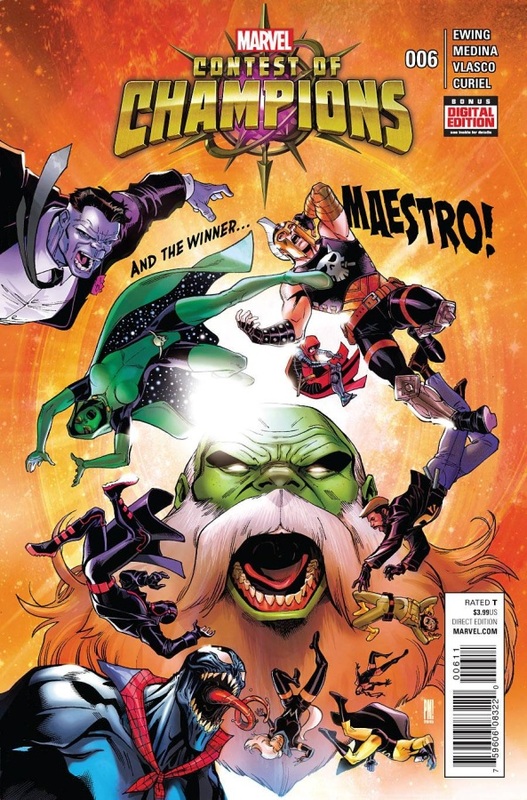 Issue ends with Black Panther’s Ultimates team now taking notice of Maestro. I imagine that this is leading to a crossover but I’m out until Magik gets another appearance or namechecked. Not a bad issue but definitely feels like an outlier of the series instead of a typical issue. Of course, I could be wrong about that. Correspondence with Champions, letters are from – Andrew J. Shaw, Challenger, Alex Martin, Joseph D. Urbick, Fernando Valencia, Chris Velayo of Manilla Philippines, Dan Tandarich and Naiajah. I do like this issue having two pages of letters. There is also a Marvel Games Team Spotlight, which is really worth reading as well. So this is definitely a game tie-in comic and we still don’t the deal with the soulsword that Maestro has.